In a Seattle-area congressional race pitting progressive Democrats against each other, Bernie Sanders could be a difference-maker. The Vermont senator has been helping Pramila Jayapal with her bid to replace retiring U.S. Rep. Jim McDermott. Pramila Jayapal has something few people running for Congress can boast: the endorsement of Bernie Sanders. And Jayapal is running in Greater Seattle, which felt the Bern this spring more than any other metropolitan area in the United States. Now that Hillary Clinton is the Democratic Party’s presumptive nominee for president, many on the party’s left wing are hoping Jayapal can convert smoldering enthusiasm for Sanders into a concrete victory for the Vermont senator’s political revolution. On Tuesday, Sanders emailed his millions of supporters urging them to help state Sen. Jayapal replace retiring Democratic Rep. Jim McDermott in Washington’s 7th Congressional District, which covers much of Seattle, some suburban areas and Vashon Island. Other leading Democratic contenders are Metropolitan King County Councilmember Joe McDermott (no relation to Jim), who endorsed Clinton months ago, and state Rep. Brady Walkinshaw, who caucused for Sanders, then recently endorsed Clinton. The top two vote-getters in the Aug. 2 primary will advance to November, regardless of party affiliation. In the 7th District, both are likely to be Democrats. “Everyone is watching. We’re interested in seeing whether people are really ready to back a progressive candidate,” said Stacey Hopkins, an Atlanta-based activist planning to visit Seattle this month to rally backers for Brand New Congress, a political-action committee set up by laid-off Sanders campaign workers and their allies. Though Jayapal is proud of her Sanders endorsement, she says she wants voters to know she’s her own candidate — not a Bernie clone. Walkinshaw and McDermott are downplaying the Sanders factor, saying voters care more about local transportation and housing solutions than a mass movement. The national spotlight on the 7th District already is affecting the race in at least one major way, however: Sanders raised about $180,000 for Jayapal in five days and doubled the number of contributors to her campaign when he endorsed her in April. Also running are Democrats Arun Jhaveri, who was mayor of Burien from 1992 to 1998, and Donovan Rivers, Republicans Scott Sutherland and Craig Keller, and independents Leslie Regier and Carl Cooper. Many Evergreen state voters lined up behind Sanders before the underdog candidate had won a single caucus or primary. Through December, Sanders garnered an estimated 57,000 donations from Washington — more than Clinton and all the Republican presidential candidates combined. By early March, Seattle ranked No. 1 among the country’s 50 largest cities for per capita contributions to the Brooklyn native, according to a Seattle Times analysis. Later that month, Sanders held five rallies in Washington, then trounced Clinton 73 percent to 27 percent in the state’s caucuses, beating her in every county (Clinton later won the state’s purely symbolic Democratic primary with nearly 54 percent of the vote). Jayapal had endorsed Sanders before the caucuses, having connected with him personally and politically during an earlier trip the candidate made to Seattle. Their meeting of minds was in August, when Sanders was scheduled to speak at a Social Security rally in downtown Seattle and Jayapal appeared just ahead of him. “I came off stage and he said, ‘You said everything I was going to say,’ ” she recalled. Sanders didn’t get a chance to repeat Jayapal’s points, as it turned out: Two Black Lives Matter activists grabbed the microphone and delivered their own message. Before introducing Sanders at a rally for his campaign later that day at the University of Washington, Jayapal requested a private conversation with him. Jayapal says she liked what she heard. “I was really impressed with his thoughtfulness,” she said. Jayapal announced her candidacy for the 7th District seat in January and Sanders went to bat for her in April, making her one of the first three down-ticket Democrats to receive his endorsement. In less than a week, Sanders raised about $180,000 for Jayapal from 20,741 donors — for an average contribution of $9, according to her campaign manager, Aaron Bly, who says he and other staff spent the first day gleefully clicking refresh on their computers as the campaign’s harvest grew. Roughly 5,000 of the donors had already contributed to Jayapal, but about 15,000 were new, and about 18,500 were from outside Washington, according to Bly. Jayapal had raised $437,538 in the first quarter of 2016. In one fell swoop, Sanders increased her war chest by nearly half and doubled the size of her donor base. “It brought a tremendous amount of outside (the state) money into the race,” Walkinshaw noted, saying his contribution mix reflects stronger local support. Jayapal was first out of the gate with a television advertisement last month, and her campaign has spent about $300,000 on broadcast TV so far, buying hundreds of spots. Walkinshaw has spent about $50,000 for select prime-time spots during this month’s presidential conventions, while McDermott has yet to spend on TV advertising but plans to, according to his campaign. The campaigns haven’t yet filed their second-quarter fundraising numbers, but Bly says Jayapal pulled in more than $750,000 in the quarter, bringing her a total to about $1.2 million. Walkinshaw’s campaign said it has raised about $840,000, with roughly half coming in the last quarter. McDermott’s campaign declined to estimate its haul; he raised $235,995 in the first three months of the year. Born in India, raised in Indonesia, Jayapal saw her activist career take off after 9/11, when her “Hate Free Zone” immigrant-rights organization — now known as One America — won a lawsuit on behalf of Somalis facing deportation. Jayapal went on to lobby Congress on immigration reform and was part of the push for a $15-an-hour minimum wage in Seattle. Those are experiences she hopes voters remember this summer. “I didn’t know who Bernie was in 2001 when I took on the Bush administration, when I registered 23,000 immigrants to vote,” the Columbia City resident said. To hear Bly tell it, Sanders’ endorsement was the crest on a wave of big-ticket breaks for Jayapal; Move­On.org’s Washington members and Howard Dean’s Democracy for America had already backed her, for example. Ilya Sheyman, Move­On.org Political Action’s executive director, says the Seattle race is drawing attention in Washington, D.C., partly because the city and its voters are already on the cutting edge of the progressive movement. Jim McDermott’s successor will have an opportunity to promote local experiments on a larger stage, Sheyman says. 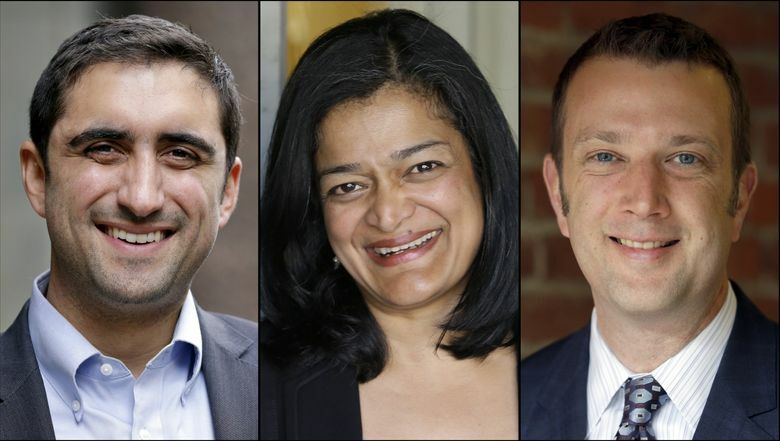 “The ability to talk about a $15 minimum wage in Seattle and what it took to get there — she can speak to her experience, with a national megaphone,” he said of Jayapal. Walkinshaw, who declared his candidacy in December, before Jim McDermott announced he would retire, raised $437,583 through March. Dozens of local Democratic officials are standing with him — and beyond Washington, so is former U.S. Rep. Barney Frank of Massachusetts. Joe McDermott, sure to benefit from Jim’s surname, also has local supporters, like King County Executive Dow Constantine, and an out-of-state booster, U.S. Rep. Mark Takano of California, who co-chairs the House’s LGBT Equality Caucus. The Whatcom County-raised candidate, Cuban American through his immigrant mother, says 7th District candidates are three different flavors of progressive. Walkinshaw says the threat of Donald Trump’s becoming president and local challenges around housing and transportation are top of mind for 7th District voters. His goal: Work to restore federal funding that’s been cut since the 1980s. The Capitol Hill resident also wants to champion a federal carbon tax, he says. McDermott, who sits on Sound Transit’s board of directors, says 7th District voters care less about Sanders and Clinton endorsements than “kitchen-table issues” like traffic congestion and crowded buses. “People want to be able to move around,” the West Seattle resident said, describing himself as the race’s most experienced legislator and capable of bringing home the proverbial bacon when it comes to transportation projects and affordable housing. The voters in the district will have the final word about what matters, of course, and Sanders die-hard Dinea Evans, of Burien, says she’ll be casting her ballot for Jayapal. The 33-year-old says she was arrested in April when she visited Jim McDermott’s office to ask that he endorse Sanders. She says no charges were filed. “If Bernie Sanders is telling me to do something and I know in my heart it’s the right thing to do, I’m going to follow what he says,” Evans said. Faraz Zarghami, a Green Lake resident so jazzed about Clinton that he recently made a manic music video cheering her on, says he’s leaning toward Walkinshaw. Joe McDermott also is gay. In Nevada, help from Sanders wasn’t enough to carry Flores to a June primary win. But Flores lost to an opponent backed by Senate Minority Leader Harry Reid and had scant time to make hay off her endorsement, says Neil Sroka, communications director at Democracy for America. Teachout won her New York primary last week.